Hello and welcome to my blog; today I am going to share with you the other version of the Tea Together Card that we made last Wednesday night during my Facebook Live, but I shared the card in my blog post on Monday. If you missed that card you can check it out here. I had gave a little sneak peek of this card while it was unfinished and had a few suggestions that I needed to go ahead and finish it. So over the weekend I did just that. Here's a look at the 2nd version of that card. I used the same designer series paper, decorative ribbon border punch, and stamp set but changed the ribbon, and focal image. 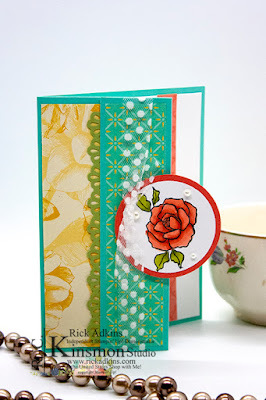 For the focal image I stamped one of the single roses and colored it with my Stampin' Blends. I used Calypso Coral and Old Olive this time for the coloring. 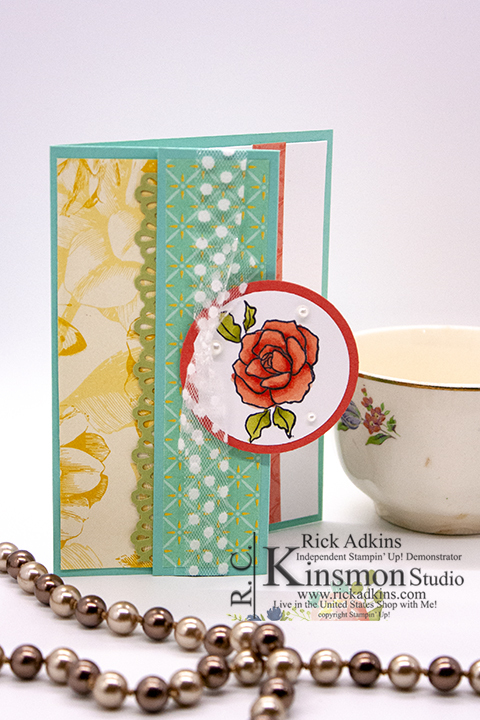 I then punched out the rose with a 2" circle punch and layered that on a 2 1/4" circle punched from Calypso Coral Cardstock. As I mentioned I changed up the colors for this card. 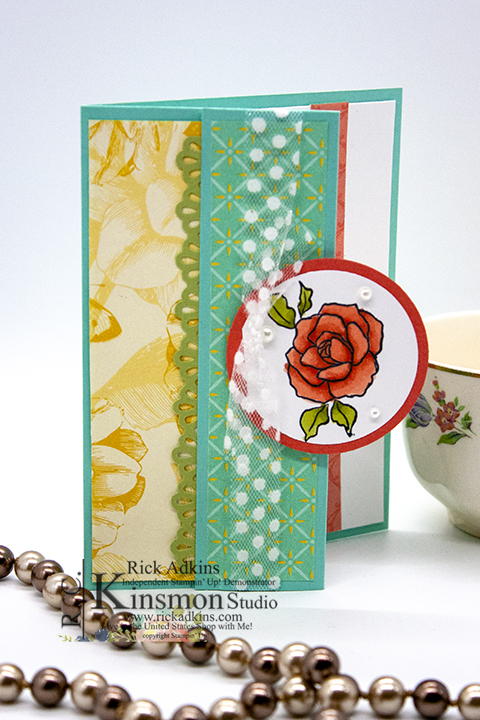 I picked a piece of the Tea Room Specialty Designer Series Paper that had Crushed Curry and Coastal Cabana on it and used a piece of Old Olive Cardstock for the decorative edge that was punched with the decorative ribbon boarder punch. I assembled the card the same way as the last one. I then added a small piece of Calypso Coral designer series paper to the inside of the card. Before closing the fun fold up I added some of the dotted tulle trim to the front. I popped the circle up on a couple stampin' dimensionals on the front edge. I didn't add pearls to the front of this design I felt that with all the different patterns of paper and the trim that the pearls would be a little to much. This fun fold is actually very easy to recreate and allows you to show off which ever side of the designer series paper you want to feature. As you can see I decided to show off three different patterns. The floral pattern and the coastal cabana pattern are on the same sheet. Stampin' Up! 's designer series paper has some of the best patterns in the last couple years. Lately they have been giving us a floral or other design on one side and a more subtle geometric pattern on the other side. Thanks for dropping by today. I hope that you like the second version of this card as much as the first. 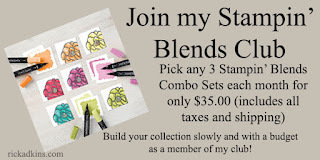 If you need any of the products you've seen today; you can pick them up in my online store 24/7 by clicking on the shop tab above or by clicking on the item in the Stampin' Up! Shopping List Below. If you are looking for a storage option for your ink pads stampin' write markers and blends we now have you covered. 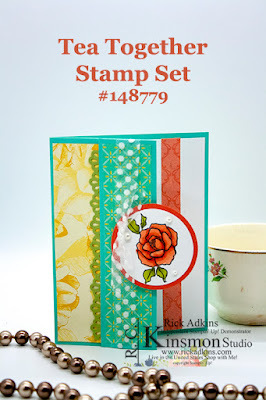 These items are actually a early release from the upcoming Stampin' Up! 2019 Annual Catalog. If you would like to order some you can read more about Storage by Stampin' Up! by clicking here, as well as order. Build your Stampin' Blend collection each month with my Stampin' Blends Club. Request information here. 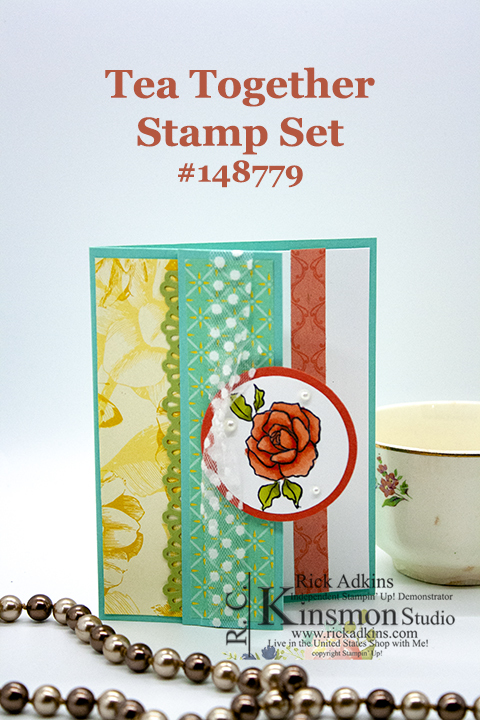 Spend $50.00 (before taxes & shipping) in my Online Store using the current host code during Aprils Creative Stampers Tutorial Bundle and get two PDF tutorials sent to you starting the 20th of the month.